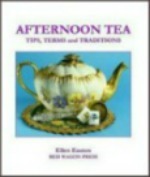 Article excerpted from A Tea Party Planner by Ellen Easton. All photos are copyrighted by Ellen Easton and may not be reproduced without written consent from Ellen Easton. For your own enjoyment, a special event, a theme party, business venture or classroom education, having a tea tasting is an easy and fun way to explore the vast variety of offerings available in the world of tea. Whether you choose to have your tea tasting with one type of tea category at a time, example all green teas, all Earl Grey teas, etc., or wish to have a broad base, introductory tasting showcasing each category is your choice. The first step is to set a table placing the dry leaf teas, with labels, into groups of white, green, oolong and black, followed by the infusions. This will allow each person to touch, smell and feel the differences in the dry leaf blends. You may also create a tray featuring the tea/infusion enhancers. Make certain you have a large slop bowl or alternative place to discard the liquid tea after each tasting. The next step, one at a time, is to brew each of the blends for the actual tasting. Each person should have a minimum of one teacup and one teaspoon per person. If you are able to supply a new teacup for each category of tea, so much the better. Do not pour a full cup of tea, as only a swallow or two is necessary to taste each blend. Do not allow the guests to dip their teaspoons into a communal cup of tea, as it is unsanitary and can spread germs. Explain that all tea, white, green, oolong and black, comes from the same plant the Camellia Sinensis – the tea trade’s international botanical name for the tea plant. Yes, one can have herbal tea, provided that there is tea blended with the herb. If there is no tea in the blend, one is having an infusion. An infusion is anything steeped in hot water to extract flavor. After the group has tasted an individual blend engage in conversation, with each person describing and sharing their experience. No one should go home without having discovered a new favorite. Brick Tea – Common grades of China and Japan tea mixed with stalk and dust and molded into bricks under high pressure. Originally, the bricks were used by Asian travelers as a convenient way of carrying the tea they needed to drink. The tea bricks were also used as currency to barter for other goods. The compresses markings detail the regions from whence they came. Orange Pekoe (OP) – Long, thin, wiry leaves, which sometimes contain yellow tip or bud leaf. The liquors are light or pale in color. Pekoe (P) – The leaves of this grade are shorter and not so wiry as orange pekoe, but the liquors generally have more color.or bud leaf. The liquors are light or pale in color. Souchong (S) – A bold and round leaf with pale liquors. Broken Orange Pekoe (BOP) – Much smaller than any of the leaf grades and usually contains yellow tip. The liquors have good color and strength in the cup and are the mainstay of a blend. Broken Pekoe (BP) – Slightly larger than broken orange pekoe, with rather less color in the cup; useful as a filler in a blend. Broken Pekoe Souchong (BPS) – A little larger or bolder than broken pekoe and in consequence lighter in the cup, but, also used as a filler. Fannings– Much smaller than broken orange pekoe and its main virtues are quick brewing with good color in the cup. Often used in tea bags. Store tea away from light in an airtight container in a cool, dry place. Withering, rolling, full oxidation and drying. Sugar or honey enhances the flavor of black tea. Milk may be served with black tea if desired. Withering, partial oxidation and drying. Sugar enhances the flavor of oolong tea. Milk is not served or recommended. Steamed, rolled and dried. Milk is never served with green tea. Yellow Teas – Rare and similar to green tea with a slower drying phase. Once exclusive to the Imperial Court of China. White Teas – Very rare and plucked from the tip of the tea plant. Exclusive to China. Infusions For Tea – Rooibos, Honeybush, Yerba -Mate, Barks, Flowers, Fruits, Herbs, Roots, Spices, Chrysanthemum, Gardenia, Jasmine, Lotus, Orange Blossom, Rose, Rose Hips, Almond, Apple, Black Current, Blueberry, Lemon, Mango, Orange, Raspberry, Strawberry, Chamomile, Cinnamon, Ginger, Mint, Rosemary, Sage, Thyme are only a small sample of the thousands of varieties available. When using the infusion method DO NOT boil the ingredients. Place the ingredients into a preheated porcelain teapot, pour in boiling water and replace the teapot lid. Allow to steep two to eight minutes according to taste. Use bottled, spring or distilled water for the best results. Suggested flavor enhancers for teas and infusions: Cinnamon, ginger, honey, milk, mint, sugar, vanilla or vanilla sticks. Bitter – An unpleasant taste associated with raw teas. Body – A liquor having both fullness and strength as opposed to being thin. Bright – Denotes a lively fresh tea with good keeping quality. Brisk – The most ‘live’ characteristic. Results from good manufacture. Character – An attractive taste, specific to growth origin describing teas grown at high altitude. Colory – Indicates useful depth of color and strength. Cream – A natural precipitate obtained as the liquor cools down. Earthy – Normally caused by damp storage of tea but can also describe a taste that is sometimes ‘climatically inherent’ in teas from certain regions. Flat – Not fresh, usually due to age. Unlike some wines, which mature with age, tea tends to lose its characteristics and taste with age. Flavor – A most desirable extension of character caused by slow growth at high altitudes. Relatively rare. Fruity – Can be due to over fermenting during manufacture and/or bacterial infection before firing or drying, which gives the tea an over ripe taste. Unlike wines this is not a desirable taste in tea. Full – A good combination of strength and color. Green – When referring to black tea liquor denotes an immature ‘raw’ character. This is mostly due to under fermenting and sometimes to under withering during manufacture. Hard – A very pungent liquor, a desirable quality in tea. Heavy – A thick, strong and colored liquor with limited briskness. High Fired – Over fired or dried, but not bakey or burned. Light – Lacking strength and depth of color. Malty – Desirable character in some Assam teas. A full, bright tea with a malty taste. Muscatel – Desirable character in Darjeeling teas. A grapey taste. Point – A bright, acidic and penetrating characteristic. Pungent – A stringent with a good combination of briskness, brightness and strength. Quality – Refers to ‘cup quality’ and denotes a combination of the most desirable liquoring qualities. Taint – Characteristic or taste that is foreign to tea such as oil, garlic, etc. Often due to the tea being stored next to other commodities with strong characteristics of their own. Thick – Liquor with good color and strength. Woody – A grass or hay taste associated with teas that have been under withered during manufacture and sometimes referred to as ‘woody’.